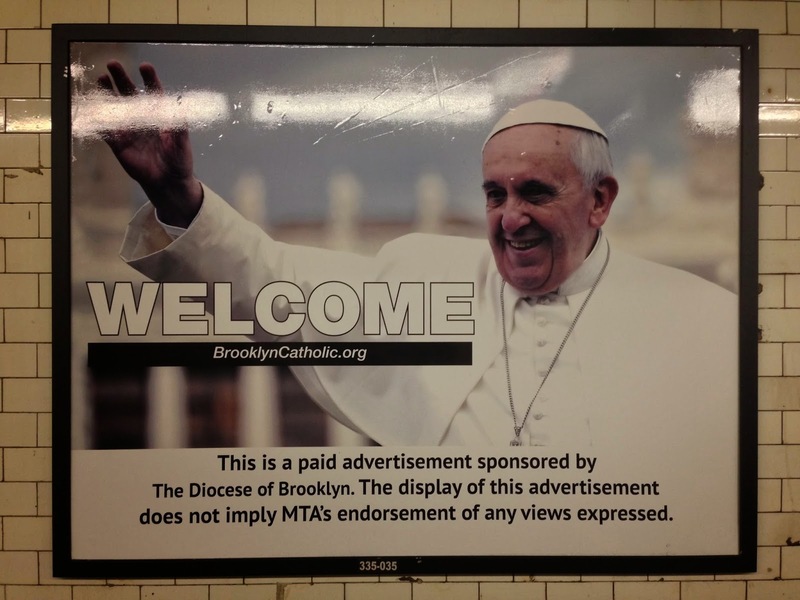 Welcome to The Secular Gospel According to Jess! In this blog you’ll find everything from cartoons that make me laugh, to quotes that inspire me, to stories of my own personal experience when it comes to dealing with religion and pretty much everything in between. 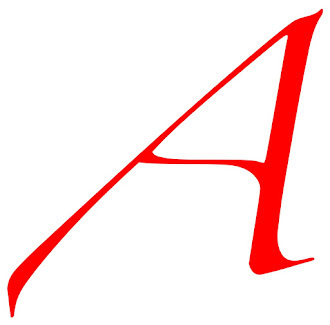 The title of my blog is intended to be ironic, as one doesn’t often hear the word, “gospel”, associated with secularism, but my intent is to preach, for lack of a better word, what I think gospel should really be about: love, rationalism, fairness, equality, human rights, science and truth. Enjoy! 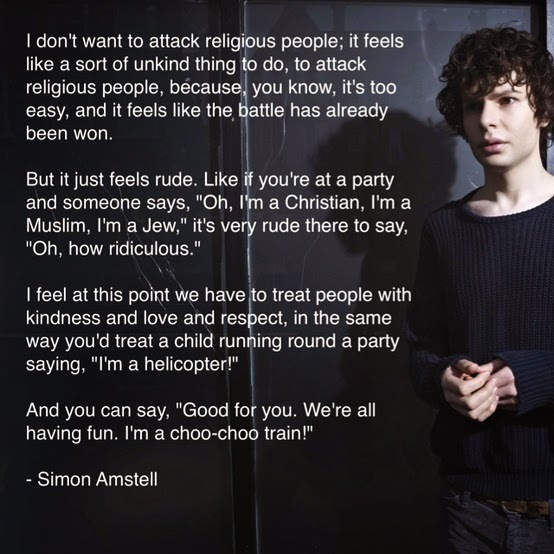 "I don't want to attack religious people..."
That being said, this quote by Simon Amstell, English comedian, television presenter, screenwriter and actor, really resonated with me because, when it comes down to it, we HAVE already won. It may not seem that way. There are surely many more battles to fight. 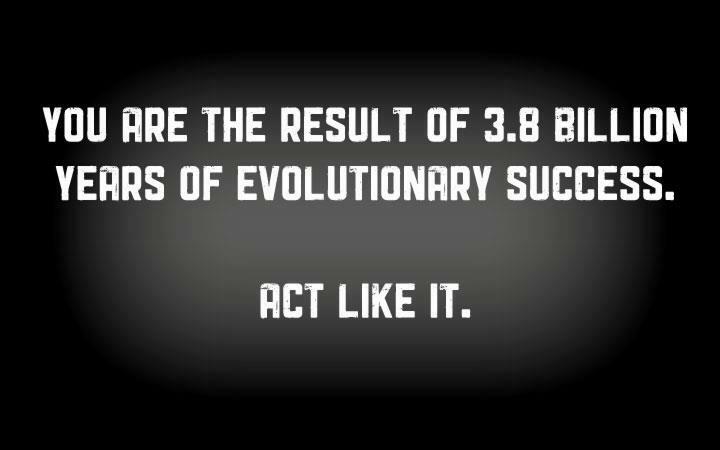 But in the end, the statistics are clear. 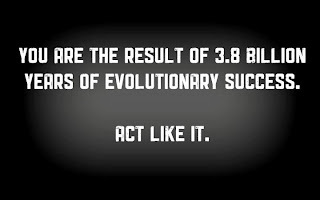 The world is less religious than it was even a short time ago, and this trend is sure to continue. So, "have faith", fellow atheists, and heed the wise words of Mr. Amstell, because we may all be lucky enough to one day live in a world without religion. A former colleague of mine got married over the weekend, and her husband's family is quite religious. The ceremony took place in a church, and although this was one of many Catholic weddings I've attended, I found myself feeling frustrated in a way I really hadn't been at other religious wedding ceremonies. The focus of the ceremony was not on my friend and her husband to be. The focus was on God. The ceremony lasted about an hour, maybe 10 minutes of which was centered around the actual bride and groom. I wished I could have heard more from his and her families, more from the bride and groom themselves...more about their journey to the altar, complete with advice from parents and friends who had been married before--not from a priest, who by Catholic law must never marry, who was simply reciting words from ancient texts as though these words were the "one size fits all" solution to what makes a happy marriage. There were so many times during the ceremony where I noted hypocrisy so clearly evident. While the priest spoke about the sacrament and unbreakable bond of marriage, both the groom and bride's parents, who were all divorced and remarried, looked on. I cannot imagine how they must have felt, being judged for "failing" to make their first marriages work. It made me sad, this generic approach to what is often one of the most important days of a person's life. I know that my own wedding will be replete with anecdotes and advice that are fitted specifically to me and my future husband, and that the uniqueness of the day and how my wedding ceremony will be different from anyone else's will be what really makes it stand out. Can a 3 question math quiz determine whether or not you believe in God? According to this article, "People who are more disposed to analytical thinking, the hypothesis goes, are less inclined to believe in a deity. In 2012, in the journal Science, social psychologists Will M. Gervais and Ara Norenzayan published the results of five studies suggesting this might be the case." I don't necessarily agree with the study, because I believe there are many complex factors that affect whether a person gets the correct answer that aren't necessarily dependent on how religious a person is. One of these factors is surely access to education, though it's certainly not a foolproof way to determine someone's religiosity. I'm atheist and college educated, but at first, the answers seemed obvious to me, too. Yet, I knew instinctively that the easy answer was the wrong one. Why was it that I second guessed myself? Was it because I've been studying for the GRE Exam and expect test makers to try to trick me with deceptively easy questions? (On an honest note, math has never been my strong suit.) Or, was it just because all my years of formal schooling taught me to think about things in more complex ways? Or was it, simply, because as an atheist, I'm just "more disposed to analytical thinking", and my education had little to do with my ability to understand how to answer the questions. In other words, does being atheist make you smarter, or does being smart make you more likely to be atheist? To make matters even more confusing, I have several friends who are significantly better educated than me who still insist that they believe in God, so, illogical as it may seem (and it does to me, too), I don't think one's level on education is always a good indicator of whether one is religious. "Needing to abide by their tribe’s traditions of modesty, Hasidic women want the city to post a female lifeguard during a women-only swim session at a municipal pool in Williamsburg, Brooklyn, and have lobbied a local councilman to take up their cause. On another front, Hasidic matzo bakeries, citing ancient Jewish law, have insisted on using water from groundwater wells rather than from reservoirs in preparing the dough used for matzos and have found themselves tangling with health officials worried about the water’s purity. 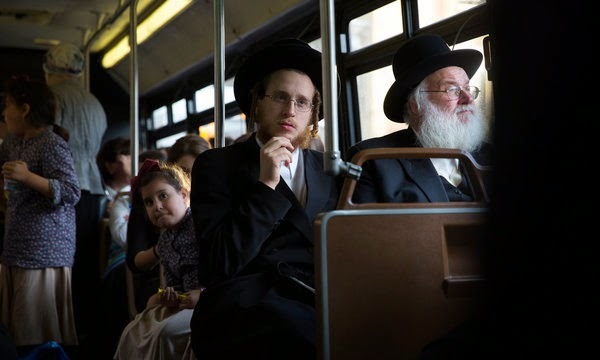 And on a public bus service that plies a route between the Hasidic neighborhoods of Williamsburg and Borough Park, Brooklyn, men sit up front and women in the back, hewing to the practice of avoiding casual mingling of the sexes, even after Mayor Michael R. Bloomberg condemned the arrangement. While these episodes may not have reverberated beyond New York’s Hasidic enclaves, taken together they underscore a religious ascendancy confronting the city’s secular authorities in ways not seen in decades. ou can read the full article at the link above. You'd never know it looking at most people. So, what does the Bible tell us? Thank you for not littering your mind. Hate is not an option, love is the only way. Orthodox Jewish newspaper photoshops Hillary Clinton out of Situation Room photo. In case you need backup.